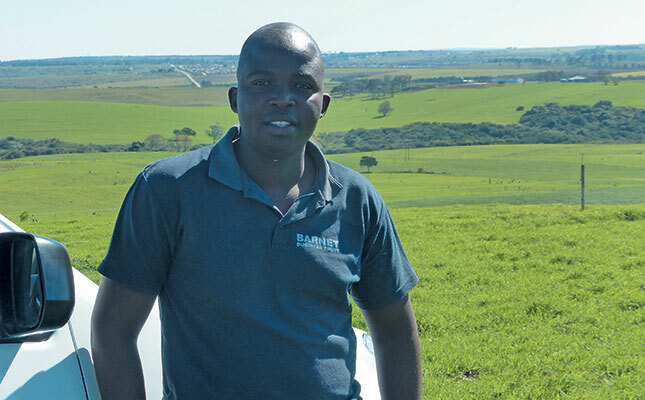 Dairy farmer Tshilidzi ‘Chilli’ Matshidzula (28) was recently named the Eastern Cape’s Argi SA Toyota Young Farmer of the Year, and could be the first black farmer to win the national title. Chilli has been instrumental in converting the farm, Little Barnet, from a failed land reform project into a dairy farm with an annual turnover of R14,5 million. Chilli matriculated in Thohoyandau, Limpopo, in 2004, attended the Tshwane University of Technology in 2005 and completed a National Diploma in Animal Science and Production. This was despite the negative attitude of many of his peers towards agriculture, he says. “When we were young, there was a perception that if you wanted to do well for yourself you needed to be an engineer or a doctor, but not an agriculturalist,’’ he recalls. Tshilidzi ‘Chilli’ Matshidzula (28) on Little Barnet farm near Alexandria. Chilli says that a motivated and efficient workforce is a critical component of a dairy operation. ‘I put a lot of emphasis on people and try to spend more time with them,’ he says. about his team of 14 workers. During his second year of study, Chilli was selected by Amadlelo Agri, a company that promotes transformation in agriculture by creating profitable black empowered agri-businesses, to work on its dairy farm, Burlington, near Cookhouse in the Eastern Cape. Chilli arrived in the province in January 2007 and admits the transition was difficult. In August 2007, Chilli was offered a management position in a share-milking operation on a land reform farm near Alexandria, Little Barnet. This was a partnership between Walter Biggs and 17 land reform beneficiaries comprising the Longvale Trust (LT). The trust had been awarded the 532ha farm and its title deeds in 1998 as part of the Land Redistribution for Agricultural Development (LRAD) programme. With a grant from LRAD and a loan from the Land Bank, LT established a beef herd. In 2007, Thembile Bhete, LT’s managing trustee, asked Walter to assist in reviving a derelict dairy on the farm. Thembile’s idea was to sell a small quantity of milk in the local township to improve the cash flow of the increasingly financially stressed LT.
Recognising the farm’s broader potential, Walter suggested a share-milking scheme in which he would provide the movable assets, including the cattle, machinery and management, and LT would provide the fixed assets, including the land and the required structural improvements. The trust’s first step was to sell some of their 180 beef cattle to manage their debt to the Land Bank. Walter then offered LT a R1,7 million loan to begin the needed improvements on the farm. Initially, large portions of bush were replaced with fenced pastures. “We started this property from scratch,’’ Chilli recalls. The derelict dairy, as well as the house, were also revamped so that Chilli could efficiently manage farming operations. In October 2007, the first 49 cows were milked in an 11- point static parlour with manual feed-out. As more pastures were established, the number of cows was increased to 190 in 2009. Tragedy struck LT in the same year with the murder of its managing trustee, Thembile. Several beneficiaries chose to leave after this, and sold their interests in the trust. This gave Chilli the opportunity to buy into the business, and with a loan from the Land Bank, he was able to buy a 40% share. The other 60% of the business’s shares are owned by two former beneficiaries, Mzwandile Leyele (30%) and the TC Bethe Family Trust (30%). Subsequently, LT was restructured into Matshibere (Pty) Ltd, which then became the share-milking partner of the Walter’s Oakleaf Business Trust. To generate funds for the new company, about 180ha were sold, and the farm was dedicated to dairy farming. The dairy currently farms 521 cows, with about 50% of the herd consisting of Holsteins, 10% of Jerseys and 40% of Jersey-Holstein crosses. The cows are supported by 220ha of dryland kikuyu pastures and 60ha of annual rye grass. The company also leases another 80ha for heifers and 10ha for hay production. Walter was particularly active in the management of Little Barnet until 2010; since then, Chilli has more or less taken over management of the farm. This gradual transfer of responsibility has been at the heart of Chilli’s success over the past nine years. “If I had started with 500 cows, there’s a good chance I would have crashed,’’ he says. Chilli’s willingness to learn from the best regional farmers also increased his chances of success. He is still an active member of various organised agriculture structures, and belongs to the Alexandria Dairy Study Group, which gives him direct access to some of the top farmers in the region. Walter’s wife, Jane, manages Little Barnet’s finances, allowing Chilli to keep track more effectively of the business’s profitability and prepare budgets, which Walter painstakingly scrutinises. Chilli adds that Jane’s effective bookkeeping allows him to make informed decisions. “A farm mustn’t just be clean and neat on the outside. It must also be clean in the books. One of the big lessons I’ve learnt is that when things are looking good in terms of the milk price and rain, don’t over-capitalise and buy stuff you don’t need,” he says. Chilli’s focus has always been on increasing cow numbers to ensure continuous profitability in order to mitigate increases in input costs. “In 2008, the cost of production was R2,30/ℓ. Now it’s R3,25/ℓ. The milk price hasn’t increased sufficiently. What has helped us keep [our heads] above water is that we’ve increased our cow numbers over the years,” he says. However, it is the potential to have 190ha under irrigation that really pleases Chilli, as he estimates that he would be able to farm and milk between 850 and 900 cows. In May this year, Chilli received a water-use licence to establish 70ha under irrigation. The water for irrigation will be sourced from a stream on Little Barnet that flows past Alexandria township. When Chilli discovered the stream, he tested the sewage-tainted water and found the estimated 250 000m3/year to be suitable for 70ha of irrigation. It was then ascertained that the stream had a far greater volume of water than initially anticipated: up to 500 000m3/ year. Chilli is now in applying for a water-use licence for an additional 70ha of irrigation, while investigating how to fund a Category 2 dam on a smaller stream that will eventually allow for the irrigation of another 50ha. However, with the increased number of cows that irrigated pastures will allow, Chilli will need a more modern, efficient dairy to process the additional volume of milk. He is therefore in negotiations with the Land Bank for a loan to fund a 50-point rotary parlour and the establishment of the first 70ha of irrigation, after which he believes the farm will be able to finance the other developments from its profits. Phone Chilli Matshidzula on 084 0811 641.